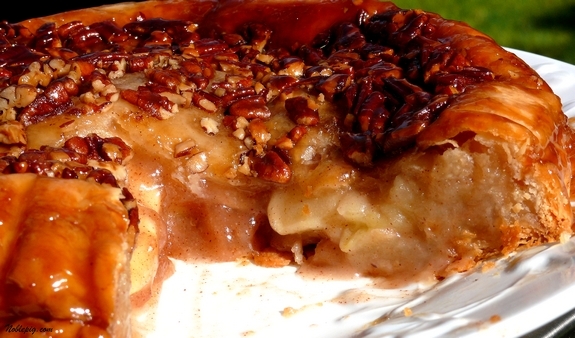 This Upside Down Apple Pie is a delicious way to celebrate Fall. The best part…no crust making skills are necessary to make this gorgeous pie. It turns out perfect every time. If you consider yourself “pie crust challenged”, this recipe is your new best friend. While I have no problem making pie crust, so many people have had bad experiences making pie crust from scratch and have just given up. It does take practice. This recipe was intriguing as it uses refrigerated pie crust. I normally do not like the texture of refrigerated pie crust as opposed to homemade, but a homemade pie crust is unnecessary here. With all the sticky goodness on top of this pie your crust efforts would be lost in the shuffle. Save homemade crust making for another pie where the crust is showcased. This pie is absolutely fantastic and after the hubby and I ate our share, we both agreed we prefer this apple pie to regular apple pie any day. That shocked me, but it’s that good. The flavor is out of control gooey, cinnamony and just overall out of this world. We are just done with regular apple pie…can you believe it? I still can’t. Make this, make this, make this for Thanksgiving, you will save yourself a million hours and can concentrate on other desserts you want to serve. Also, you do not have to worry about making the crust look pretty with fluted edges because you are going to flip it over, another plus. Coat a deep-dish pie plate with nonstick cooking spray and line it with parchment paper. Coat the paper with cooking spray also. Now, I used a deep-dish pie plate, and it is a little deep for refrigerated dough (there is not a lot of hangover for sealing the two crusts together). A regular pie plate is also fine, you just end up with more of a crusty edge. The video to this recipe uses a regular pie plate so you can decide on the look you want. 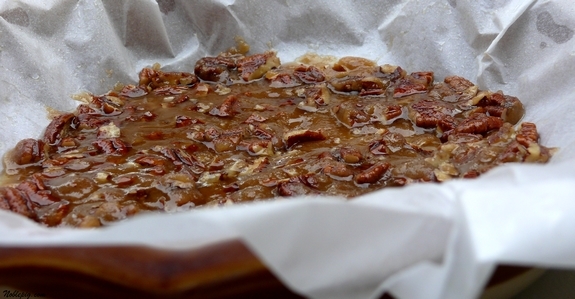 In a small bowl combine 4 Tablespoons of melted butter, brown sugar and pecans. Mix well and spread evenly over the bottom of the pie plate, on top of the parchment. Place one of the crusts in the pie plate, pressing it firmly against the nut mixture and up the sides of the plate. Set aside. In a large bowl, combine granulated sugar, flour, cinnamon and the remaining 2 Tablespoons of melted butter. Mix well. Add the apples in and toss gently to coat. Spoon into the pie crust. Place the second crust over the apple mixture. Trim and fold the edges together to seal and cut some slits in the top of the crust for venting. Because my pie dish is so deep I sealed the edges the best I could. I really couldn’t fold and seal but it didn’t matter at all. Bake 1 to 1-1/4 hours or until crust is golden brown in a 375 degree oven. Mine took 1-1/4 hours in the bottom third of my oven. Make sure to place a cookie sheet on the bottom oven rack to catch any drips from the pie. Let the pie cool for 5 minutes and then place a plate that is larger than the pie on top of it and flip it over. Use oven gloves as it will still be hot. Remove the pie plate and gently lift the paper. Allow to cool. Serve warm or at room temperature. Coat a deep-dish pie plate with nonstick cooking spray and line it with parchment paper. Coat the paper with cooking spray also. Now, I used a deep-dish pie plate, the Emile Henry brand from Williams-Sonoma and it is a little deep for refrigerated dough (there is not a lot of hangover for sealing the two crusts together). I think a regular pie plate would be fine. Place the second crust over the apple mixture. Trim and fold the edges together to seal and cut some slits in the top of the crust for venting. Because my pie dish is so deep I sealed the edges the best I could. I really couldn't fold and seal but it didn't matter at all. Bake 1 to 1-1/4 hours or until crust is golden brown in a 375 degree oven. (Mine took 1-1/4 hours in the bottom third of my oven.) Make sure to place a cookie sheet on the bottom oven rack to catch any drips from the pie. This is the pie I made for my birthday! While I am not the biggest apple pie lover (GASP) everyone else is and so when my brother suggested I make it for my Birthday – I did so! Everyone loved it. It is a cool idea! This could not have come at a better time! I have a ton of NY apples to use up and my pie crusts tend to be epic failures. If you look in my facebook pics (erin neu) you will see one of the worst! OMG! I have no words! I think I would prefer that to regular apple pie too! What an awesome idea! Gorgeous pie Cathy, very very pretty! 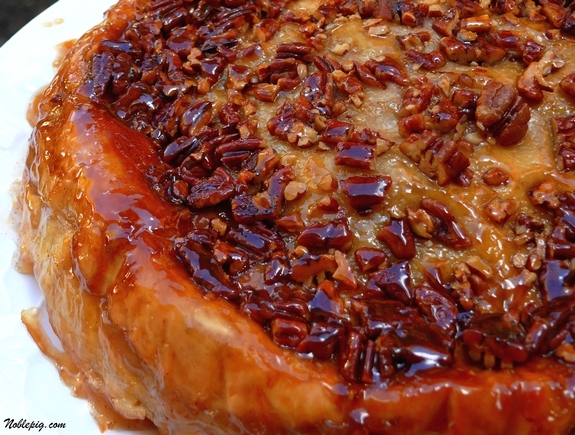 Just done with a praline pumkin pie, and now am dreaming of this one. This looks AMAZING! I love, love, love apple pie!! Come on over, I have got the ice cream! I’m so glad you made this and loved it too. I think it’s the perfect pie for Thanksgiving! Thanks for making it! Now that looks like a pie I would like to try! I just do not like traditional pie crust for sweet pies. I almost always prefer a cookie crumb crust. This looks like it would be good though. OK now this and your recent broccoli dish will be gracing my table this thanksgiving. I cant wait that long to try this one however. WOW I am sooo making this! Forget Thanksgiving! I want to make this now! Oh My Gosh. I think I’ve just lost it. No more apple pie for me. My Man’s family lost it over the crust I recently made for apple pie, but I think this would BLOW THEM AWAY!!!! Definitely making it this weekend! oh what a wickedly delicious looking pie. all that dribbling goodness and nuts on top takes it over the top. OMG – that looks sinfully good. You have convinced me…I’m making it today! When I taste different pies, mostly at the holidays, I think, “Ooh, this is my favorite.” And I seem to say that about almost all of them. But I really think apple might be my favorite. I will be making this. It looks divine. That is some kind of pie! Oh my. I need some of that, right about now =D. OMG–Cathy that looks fantastic! I need some apples recipes and this fits the bill perfectly!!!! It just looks amazing! Thanks for posting! This looks wonderful. You’ve intrigued me and I’ll have to give this a try. You may have convinced a lot of folks to try this for the holidays. We love making homemade pie crusts and have gotten much better at it since our start last year, but you’re right…no need to go homemade for this one. Premade will do! This photo makes me want to lick the screen. It’s apple season! Everyone needs to go a little apple crazy. Now I can’t decide what apple dish to make after seeing this one for Thanksgiving. =P This is out of its world amazing looking! I was going to tackle a pie crust this year since it’s been several since I’ve made one and I’m sure my grandfather is having fits from beyond since he taught me how to make it! But…this looks sooo good, and sooo easy, what a great excuse not to flour up my counters…heehee. Ohhh! That looks soooo yummy! You are giving recipes faster than I can try them! ANd I want to try to manY! Note to self… must wipe drool off of keyboard. There’s apple pie and then there’s APPLE PIE. This is definitely the latter rather than the former…oooo ya! NOW you tell me! And I’m just barely pie crust literate! Whoa. This is some kind of delicious. I’m sold. Stunning. I love apple pie but hate making crust. I have to try this! 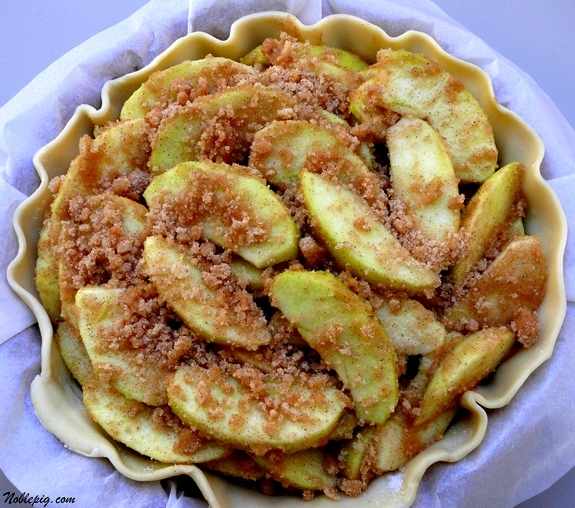 OMG..forget about the apples, lead me to that caramel-encrusted pie crust! I have seen this pie and bookmarked it but have never made it. I think I have to change that. Looks wonderful, great photos! I’m definitely pie crust challenged 🙂 so this is a recipe for me! Gorgeous! That’s probably one of the best apple pies I’ve ever seen. I am definitely one of those people who suffer with making crusts. I am one who is pie crust challenged. This recipe sounds like something I can handle, and I will certainly try it. I will pick up some Granny Smith apples at the store next time I go and surprise my husband with this apple dessert. I know he will love it. (His first wife used to make fruit pies all the time and he misses them a lot, and I do not have good luck with pie crusts, nor do I even want to learn how to do it). I prefer the prepared crusts because of the convenience. Thanks a million for this one. I know I can please my husband with this one. The best apple pie I’ve ever seen. Hah — I never would have thought to flip my apple pie over! There are definitely times when the top doesn’t look beautiful. This is a great way to hide the flaws. I have been looking for a “different” dessert for Thanksgiving dinner and I think this just might be it! It looks yummy! That does look incredible! 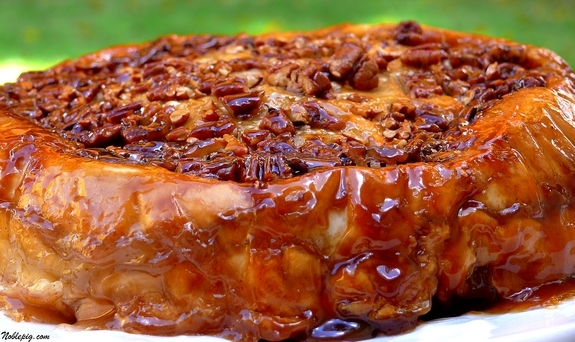 The gooey, sticky, caramely layer that ends up on top is calling my name. Whoa does that look good. For a real “Oregon Twist” I think I might use Hazel Nuts instead of the Pecans. But what the heck either one would be great. This looks so good and I happen to have about a million apples around, so–perfect!! This looks AWESOME! I can’t stop starring at those pictures! Cathy, you have a real talent for making deadly, diet killing things. I might just lose sleep over that one. Beautiful!! Promise mine will look just like that? What a great idea! This looks so pretty I have to try it though I was beginning to get really fond of homemade pie crusts. Wow, that looks delicious! And I love apple pie. I WILL be trying this. I have been making this pie for years, it won the Pillsbury bake-off in the fifties. It is the best apple pie I have ever had…better even than McDonald’s apple pie. One of the guys I work with has an apple orchard and is bringing me apples tomorrow. I will be making this to bring in to work for them-it looks delish! this looks absolutely out of this world….but since I live in India, I will have to make the make the pie crusts….I dont think they are easily availanle in the market. WOW…. that first pic alone had me sold… looks incredibly delicious! My oh my … this looks heavenly!! Wow! This looks yummy. Going to give it a try next weekend. Made this pie today. Delighted that it looked just like the one pictured here.I had one problem i hope someone can help with – the gooey outer coating ended up being a bit too hard, esp. around the edges. What did I muck up? Thanks! I tried this recipe yesterday and it turned out picture perfect. My family was very impressed as it was the show piece of Sunday’s dinner. Cathy, thanks for a show stopping and simple recipe. This pie will definitely be on our Thanksgiving table. My wife is SO going to love this! She loves apples. I saw this on Saturday,made it on Sunday and Tuesday it was gone.It is the best apple pie I have ever tasted and it is now the only one I will ever make.The whole neighborhood now thinks I am the best pie cook in town. (small town)Even the Amish girls asked how to make it.Thanks for this incredible recipe. This seems like one popular pie on the foodie blog scene. Great images too! This is definitely making it to the dessert table for Thanksgiving this year. Can’t wait to try it out. In fact, I might have to make one a couple of weeks before Thanksgiving… just to try it out, you understand. do you think i could make this ahead of time (like a day ahead of time) and just bake before serving?? I made this a couple of weeks ago, right after your post, and it was hands down the best pie I’ve ever made. It will for sure be the recipe of choice going forward. Thanks!!! This is hands down the best pie I have ever made/eaten. Made it tonight and still can’t believe how easy and delicious it was. Can’t wait till Thanksgiving when I’ll have to make 2 or 3 to satisfy the crowd. This was the first pie I ever made…and it was amazing! I didn’t feel like going to buy a crust so I made the one in the link below. It was the first pie crust I ever made as well, and my family is making me make two more for thanksgiving dinner. So if you have never made a pie crust before, or if your pie crusts don’t turn out right, try this recipe and you will never buy crusts again! Made this to try it out for Thanksgiving…wonderful! This is the BEST pie and everyone is looking forward to it because I told them about it. Thank you for a great recipe! I made this yesterday for Thanksgiving. OMG This was soooooo good. So fun to make. Thank you so much for posting this recipe up, it has been decided that this will be a tradition at my moms. Happy Thanksgiving! Thanks so much for sharing, I made this for Thanksgiving and it was a huge hit…I’ll never make regular apple pie again! Definately re-making for Christmas! 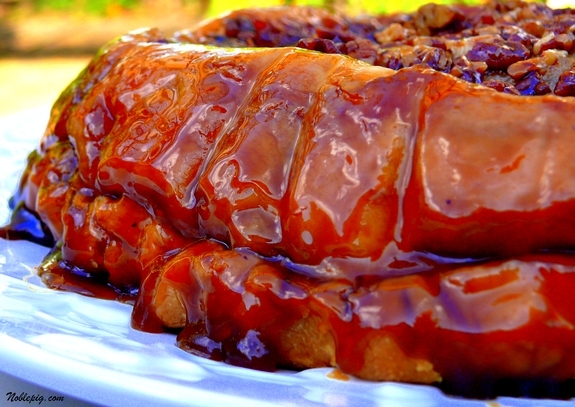 i cant wait to try this… i sent this recipe also to my friend… looks sooo good. I found this and sent it to my mother to make for Thanksgiving. It was such a huge hit she made it for 3 different Christmas parties, as well. One of the Christmas parties was a “Bake-Off” and of course this wonderful pie won! Thanks for sharing it. I’m sure it will be on the table for years to come. This is just too fantastic! All apple pie recipes are so similar, but yours is absolutely wonderful!!! I wanted to share so I added a link on my site so that I can share with friends! Great recipe! I will continue to follow and check out your other recipes. I think that to receive the business loans from banks you should present a good reason. Nevertheless, one time I’ve received a commercial loan, because I wanted to buy a building. Make your own life more simple get the loan and everything you want. Thanks for posting this recipe. I just made the pie for my brother-in-law for Father’s Day tomorrow. It was super-easy, and the neuropathy in my hands is happy that I didn’t have to knead or roll out pie dough. My caramel glaze didn’t cook completely in some spots, but I suspect that had something to do with the extra pecans I used and the unreliable temperature of my oven (the damn thing fluctuates between 325F and 450F when I try to set it for 375F. Oh! Brilliant 😀 That pie you’ve made is killing me. So glorious! I made this for my family last night. My husband isn’t a big sweet eater…he had 2 pieces and really wanted another! The kids loved it as well. I will use this recipe often! Thank you so much! Wow! This looks great! Will make a couple of these for a thing we do at work every fall for tomorrow and then of course a couple for thanksgiving!!! Yep! I made these and they are just TO DIE FOR!! Can’t wait for Thanksgiving and Christmas to have more! BEST PIE EVER! Hands down! Great idea- can’t wait to try this! It looks SO yummy. At first glance (when I just stumbled this page), I thought it was something nasty. But a further inspection, it actually looks quite delicious. I’m marking this recipe to make at Thanksgiving! I made this yesterday for my wife and her mother and got absolutely rave reviews. My wife posted it on her Facebook page and I got several requests for the pie and two for something else. Thanks. I made this pie at least 10 times over the holidays by request…and lucky for me i got another request this weekend! Ive doctored the recipe and added raisins and put a few pecans on the inside! Phenomenal!! This is my favorite apple pie!! I’m dying for one now after reading your current post about apples!! This looks unbelievable!! Can’t wait to make it this fall! This turned out great and was easy! Thanks for sharing with beautiful pictures. Perfect amount of sugar. My substitutions (I wanted to use what I already had in the house. ): Apple Pie Spice = All Spice + pinch of Nutmeg, Pecans = Toasted Slivered Almonds, Refrigerated Pie Crust = Betty Crocker boxed pie crust mix. Thank goodness it doesn’t matter what the crust looks like since I rolled my own. LOL I will not buy another apple pie. I made this with some macs I had and the results were outstanding! Thanks for sharing 🙂 my husband and I both agree, the regular boring pie we were used to has been replaced! I put the tin pie pan that the frozen crust came in on top of the baked pie and flip it over, take away the baking dish & carefully remove the parchment paper from the sticky bun topping. This pie is amazing!!! Talk about creativity! I’m so intrigued and I absolutely need to make this. Wonderful! do you need to peel apples first? You forgot to include when to add the pie spice. Obviously, it’s when you add the cinnamon but thought I’d mention although it may have already been said. Thanks for the recipe! Hmmm, I’ve never had mine harden up? I was going to buy fresh sliced apples how many cups would I need? I have been making this apple pie for the past three years, it is now my favorite, go-to apple pie. 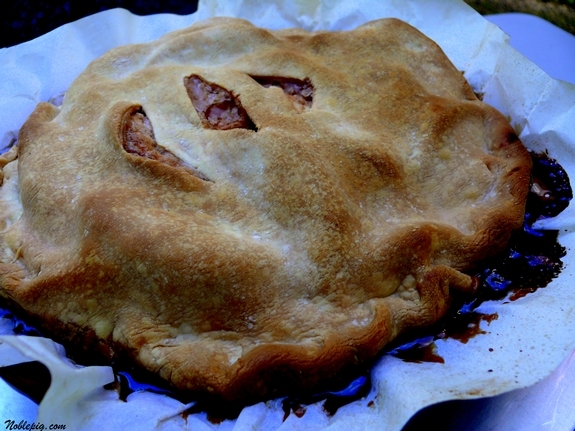 I usually use six apples, have made my own pie crust a few times. Always turns out yummy! This is my 3Rd time making this pie and I tell you It Is The Best Apple Pie I Have Made !!! And I will never make another recipe. It is so DELICIOUS !!!! I just made this and a baker I am not! It was fantastic!! Thank-you! !